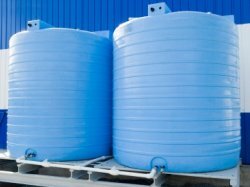 Most common plastic tanks are poly water tank, fiber-reinforced plastic tanks, and metal aquaplate® tanks, a steel polymer composite designed specifically for long life water tanks. They are generally large round or oval shaped tanks. Plastic water tanks for household use come in several sizes ranging from 500 to 5000 litres but can go up to 45000 litres for residential or commercial use. Round tanks for home use come in sizes of 1000 to 7450 litres. Other type of polyethylene tanks are called waterwall rainwater tanks. They look like a plastic wall and are made to go flat against a wall,as the wall of your house. Price range is around 1300$ and they have a capacity of 1200 litres. They are ideal water tanks when you require a large water storage capacity but are a little restricted with space. Before buying your plastic water tank or rainbarrel, always consider doing the square foot calculation of your roof area so you'll know exactly how much rain water you'll be capturing and will also know if you need a plastic tank or a standard rain barrel. It all depends how you want to go about it. You can have one large plastic water tank or have a chain of rainbarrels to make a large capacity or you can also decide that you only want 2 or 3 rain barrels and the rest of excess water will exit into your flower bed or garden.